Quick and easy microwave recipe: Sweet chilli salmon! I don’t know about you but some days I just can’t be bothered to cook! Maybe we’ve got in late or the kids have been particularly challenging but sometimes I just don’t have the time or energy to slave over a hot stove or even bother to preheat the oven! My secret weapon for these kind of days, I have no shame to say, is my microwave. There’s so many quick and easy microwave recipes that we use in our house and I thought it was about time that I shared one of them! This post has been written in paid partnership with Panasonic who have recently unveiled their new range of microwaves. I honestly don’t know what I’d do without our microwave so if you don’t have one or are looking to upgrade you can check out their new range and more great microwave recipe ideas here. This recipe is quick, easy and relatively healthy. It serves two hungry little foodies and always goes down a treat in our house! Carefully uncover the salmon and use a fork to flake into bitesize chunks. Put the vegetables in a bowl and cook in the microwave for 3 minutes. 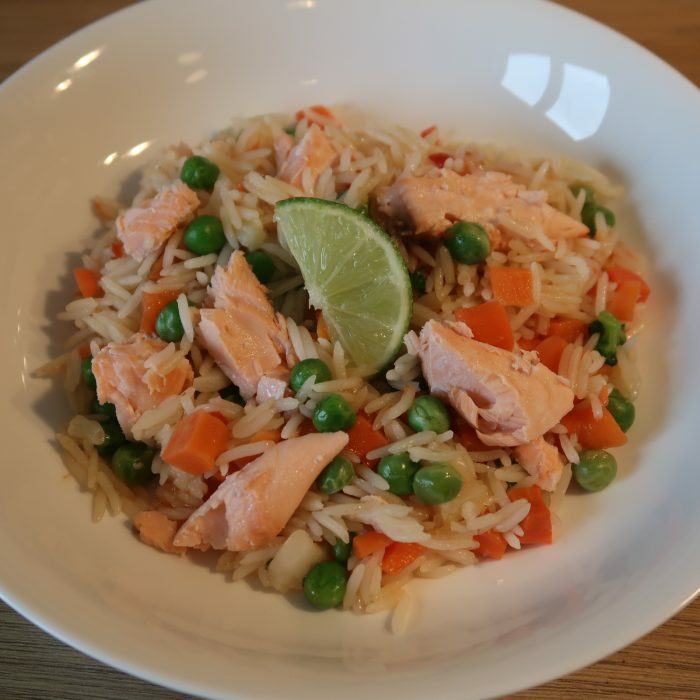 Mix the rice, vegetables and salmon together. Stir through the sweet chilli sauce. Ensure the food is cool enough for your little ones and serve! It really is that easy! What else do I cook in the microwave? Scrambled eggs, just mix the egg, a dash of milk and some butter, pop in the microwave and cook for approx 2 mins! Beans – really, who can be bothered washing a pan just to heat up some baked beans!? Mashed potato – Lots of supermarkets sell frozen mashed potato or you can freeze your own. We defrost this in the microwave with a dash of milk and a knob of butter for a quick and easy mash when we can’t be bothered slaving over the potato peeler! Cake – Back in my uni days I was quite partial to a cake in a cup! There are lots of recipes online if you want to give this a go! Poppadoms – If you buy the ones you cook at home, spray with a little fry light and cook in the microwave they make a great, healthier alternative to traditional poppadoms cooked in oil. What are your favourite microwave hacks when cooking for your family? I’d love you to share!